A resident called into SERVPRO concerning water damage. 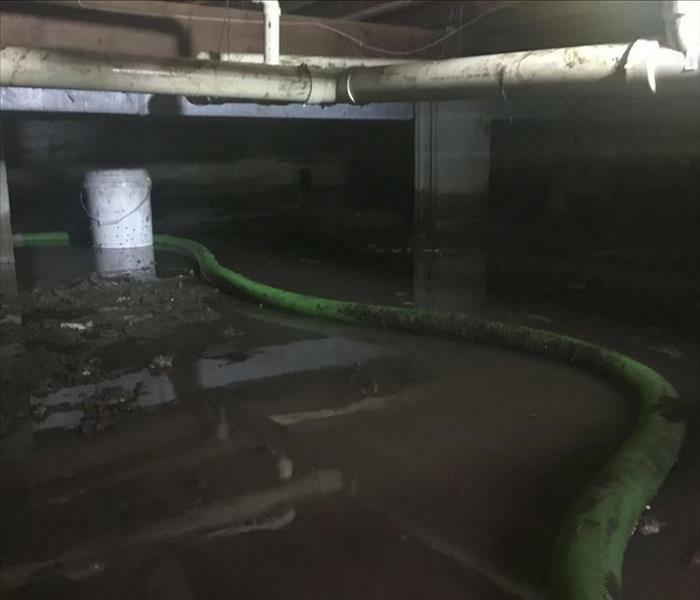 The water line between the house and the city hook up broke during the night causing flooding in the resident's crawlspace. Once the water was shut off, 2 inches of water was left standing at the base of the crawl space. One of our crews came out to extract the water immediately to avoid any other complications. Call SERVPRO of Champaign/Urbana for any of your emergency service needs, reach us at (217)355-0077. The Property Manager of this commercial property contacted us after a car drove through the buildings front window scattering glass everywhere. SERVPRO was contacted to come to clean up all the glass and debris from the car collision. Table and Chairs were removed from the area and cleaned. 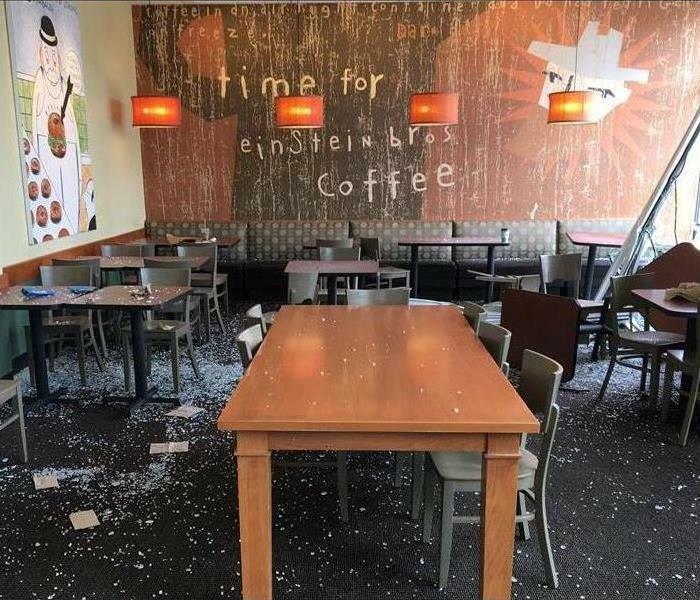 Once the area was cleared of chairs, table and large pieces of debris, the rest was swept up with brooms and dustpans, moved to supplied dumpsters and vacuumed leaving no glass and debris behind. After 90 minutes the designated area was clear of all glass and debris and SERVPRO finished the job. Call SERVPRO of Champaign/Urbana for any of your commercial cleaning needs, reach us at (217)355-0077. A customer walking into a carpeted Community Building with tar and road asphalt on their boots caused heavy soiled footprints in the front office. After a production tech scrubbed the spots with a solution they began to lighten but the footprints were still present. The crew lead then tried our product "Miracle Worker", after letting it set on the prints for a few minutes he then used hot steam to lift the stain. The spots were no longer on the carpet. 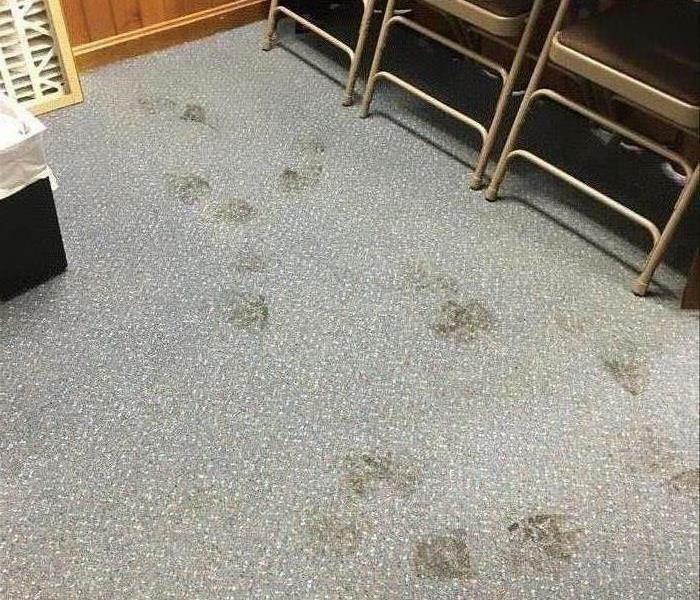 The Office Manager of the Community Building was very pleased, and in disbelief that SERVPRO could remove the footprint stains. SERVPRO was called to the scene of a fire for cleanup. 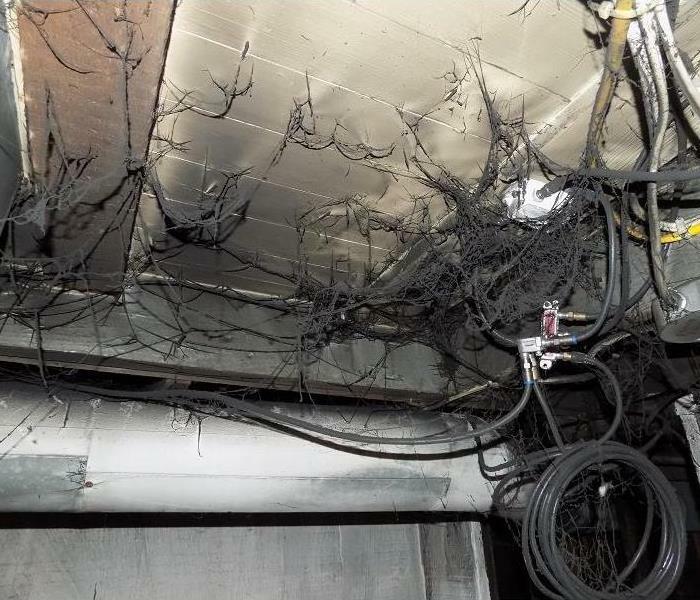 A facility experienced a piece of equipment catch fire resulting in part of the building being damage and lots of soot throughout the premises. This facility is the storage source for two businesses in the area. SERVPRO was the right choice to make, we are able to restore not only the building but most of the contents being stored. Being able to help people and businesses in need is our specialty, call SERVPRO of Champaign/Urbana any time day or night for your emergency service needs at (217) 355-0077. Congratulations to our very own Tavell Davidson and her family on their new home sponsored by Habitat for Humanity of Champaign County! Tavell is part of our Production team here at SERVPRO of Champaign/Urbana. She volunteers for Habitat for Humanity, which got her interested in applying to receive her very own home. She worked each day for us and then to the work site for her house directly after. We enjoyed sharing our love and showing support at the Ribbon Cutting. We all love you Tavell, and wish you and your girls all the best in your beautiful new home! Did you know that we here at SERVPRO of Champaign/Urbana volunteer our services to the Habitat for Humanity in Champaign County? We love to give back to our community, so what better way than to clean each home before move in to be sure they are walking into spotless home. Another Successful Ribbon Cutting! Congratulations to Advance Service Inc. on the opening of their new location in Illinois. They offer staffing services and jobs for a wide range of positions and locations. They are happy to provide services in 43 states with over 50 branch offices to better serve their clients and employees. Advance Service is based out of Nebraska and this is the second location in Illinois. You can find them at 1903 N. Neil Street, Suite F in Champaign. We loved being a part of this special evening. Getting involved in the community and helping get the word out about fellow businesses is a big part of what we do here. SERVPRO of Champaign/Urbana wishes them all the best in their future! 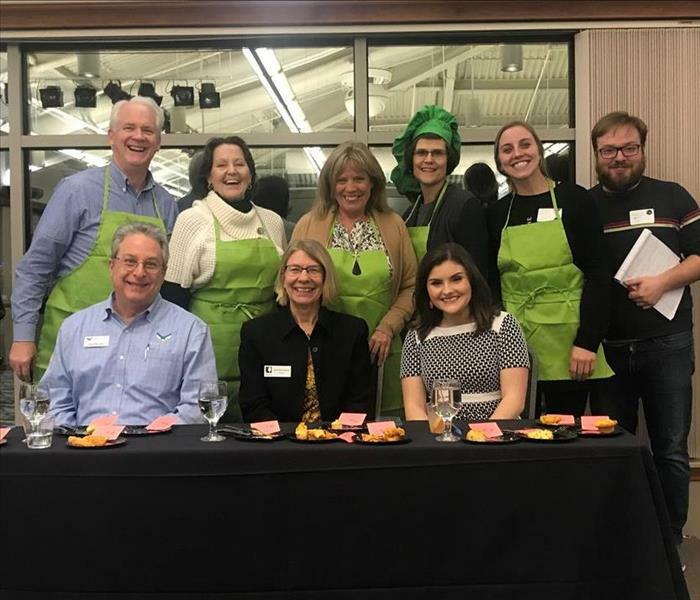 SERVPRO of Champaign/Urbana attended the Urbana Business Association event in February 2019 that involved a cooking competition. The sponsors of the night were Connections over Cocktails and Dish Passionate Cuisine. Businesses could enter into the competition with teams of five to learn a Dish Passionate Cuisine recipe and compete to see who can make it taste the most similar to the original.The team with the most comparable and the greatest quality taste won. The UBA held a fun, tasty night that we will remember for years to come. We got pretty competitive but when all was said and done we all enjoyed each other's dishes. SERVPRO is looking forward to the next cooking event. Want to learn about SERVPRO and how we get involved in events around the community contact at (217)355-0077, we would love to share our info with you if you're interested. Mold Keeping You from Showing Your Apartment? Mold can be very unsightly and discouraging to your future tenant. It can also come with a lot of potential health risks keeping you from leasing that pesky apartment. SERVPRO has licensed IICRC staff members certified in mold remediation so you can always trust us to take care of your secondary growth issues. The winter of 2018 was one to remember. Many thought it might never end! With certain areas of Central Illinois reaching lows of -15, old man winter let us have it. Extended periods of sub zero temperatures bring on the dreaded frozen pipes. We have learned to adapt to the cold weather temperatures in most cases. Unfortunately for this assisted living facility, the main water line for the sprinkler system, located on an exterior wall froze and broke. 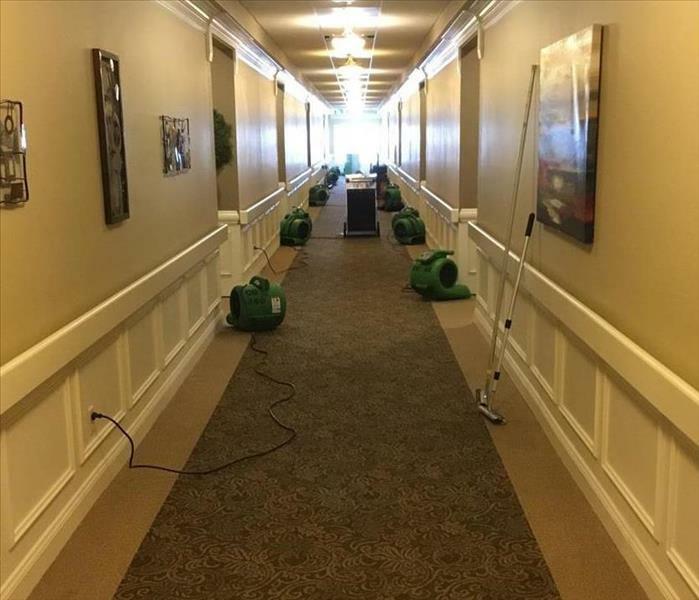 Within a matter of 48 hours, SERVPRO was able to have the residents back into their respective rooms. SERVPRO is capable of putting your life back together after a tragic event. We handle the process from beginning to end. Our water mitigation and fire restoration services are a staple of our company. The construction team then works to get the house back to pre disaster condition. When you don't know where to turn. Call SERVPRO for all of your water, fire, mold, storm and construction needs. Let's face it, nobody likes shopping ankle deep in water. For commercial businesses, SERVPRO's number one priority is to get your business back to functioning the way it did before your loss. 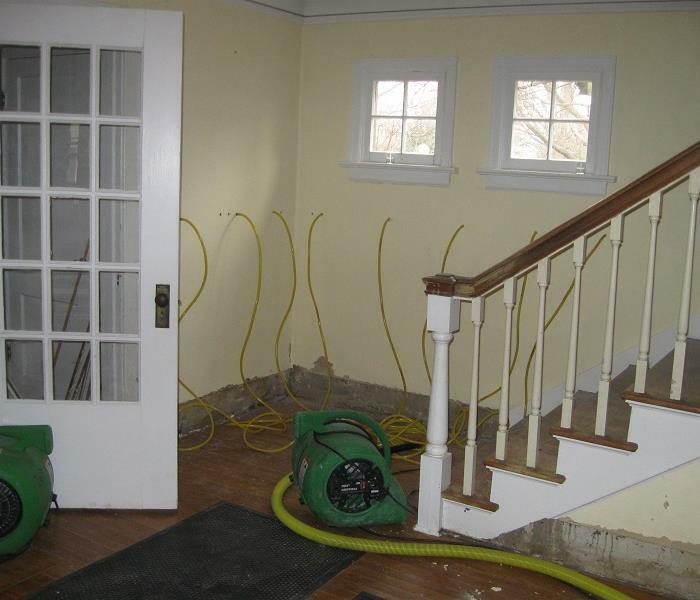 No matter how big or small of a water damage, count on SERVPRO to keep you in business as steadily as possible. 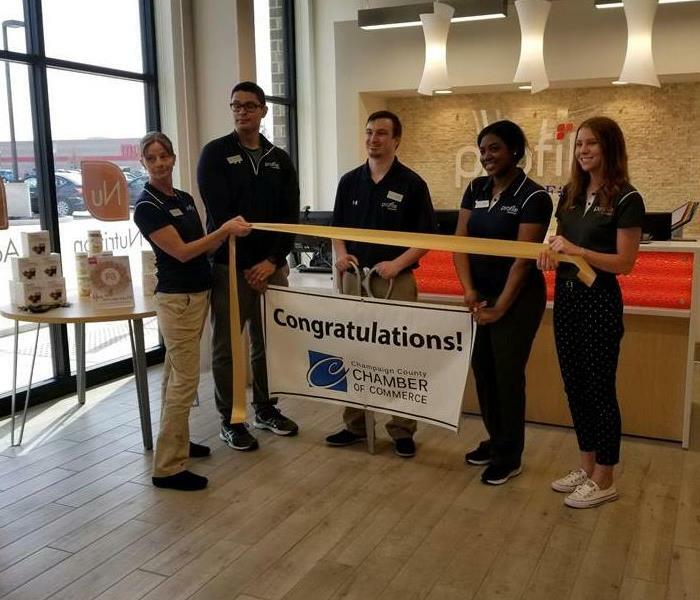 A great edition to North Champaign opened up this week, Profile by Sanford! They have a great business model that involves weight loss programs based on YOUR personal DNA! With Profile and Core Life opening up very close to each other, both focused on a healthier lifestyle, lots of opportunities have came to fruition for the both of them. Ron, the franchise owner, is grateful to be able to open this location in Champaign. He is expecting great results. A huge SERVPRO Congratulations to Profile by Sanford! No better way to start the week off than to congratulate La-Z-Boy on their new location on Town Center Blvd. in Champaign! Haley and her staff have been working tirelessly to prepare the new location's layout for today's event. This was a great opportunity to celebrate with the La-Z-Boy team on their exciting new path and SERVPRO wishes them the best of luck in the upcoming years. There's never a convenient time for anyone to have a fire, especially with events planned 72 hours after the blaze started. Emmanuel Episcopal Church trusted us in cleaning and deodorizing the main portion of the church after the rectory was scorched, and then doused with the proper amount of water to extinguish the roaring fire. In record time, SERVPRO was able to finish what we needed to do and the Church was able to have their service later that week. 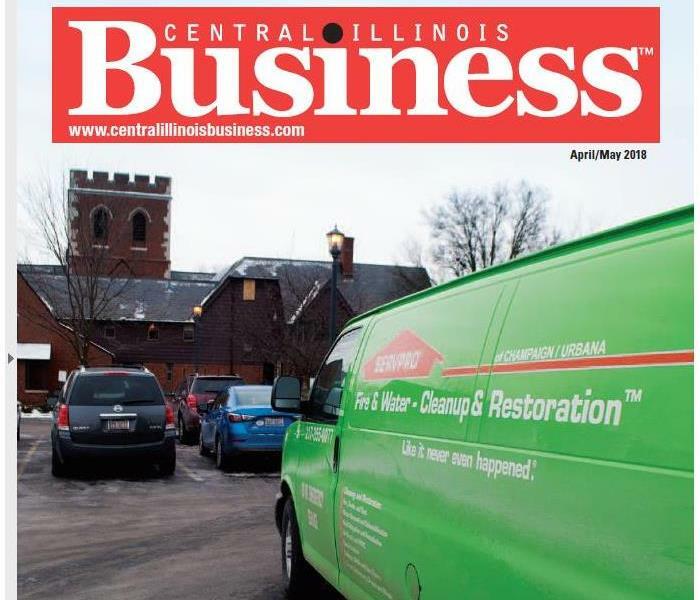 We are beyond thankful for the opportunity to be the Cover Story on the most recent Central Illinois Business magazine for April/May. With a community-based mindset, SERVPRO takes pride in helping out our surrounding counties when they need us the most. 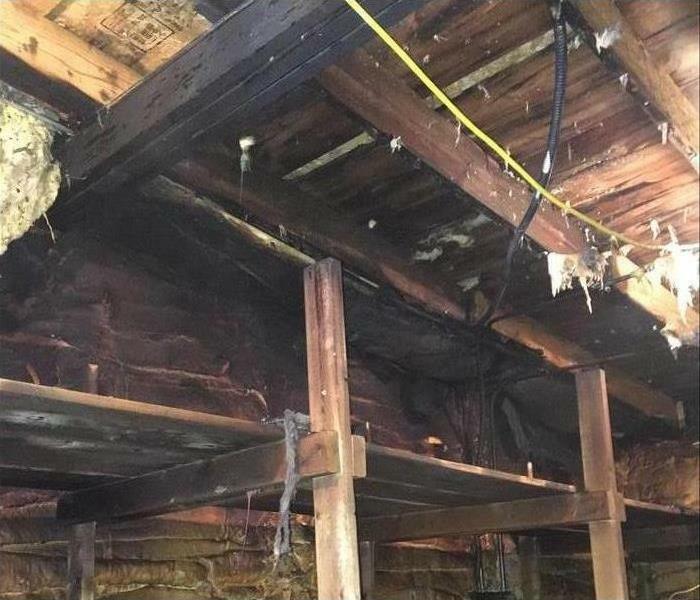 This is the aftermath of a fire that could have engulfed the whole house if it wasn't for our brave men and women working at the Cornbelt Fire Protection District in Mahomet. This isn't your typical Halloween decoration. In fact, these are not made from cobwebs at all. Smoke webs occur when the ionization process of burning synthetic materials (rubber, plastics etc.) create charged particles that tend to cling to certain surfaces. These charged particles will attract to themselves repeatedly and form "chains" of soot. Smoke webs are especially common in low heat or smoldering fires which produce "wet smoke." The webs are common in stagnant air spaces such as the corners and edges of ceilings or cabinets. Soot from synthetic materials is tacky, pungent, and smears very easily with conventional cleaning products. Our Production Staff uses professional grade chemicals specifically designed for smoke and soot produced by any material. 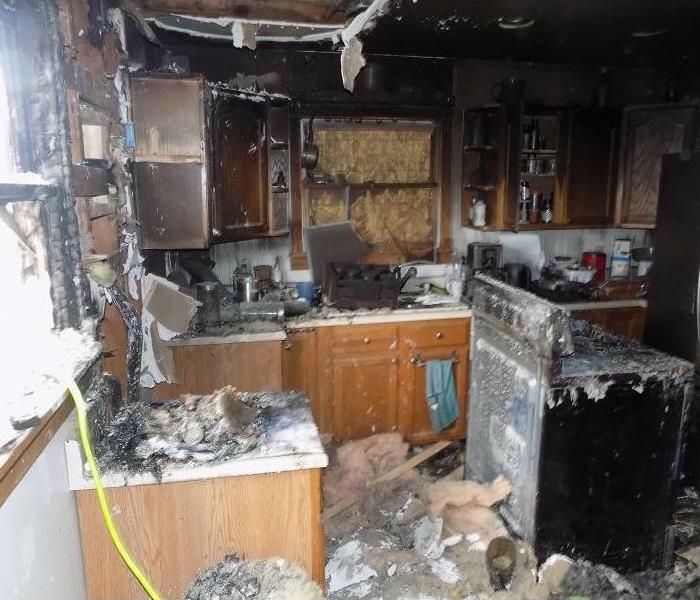 No matter how big of a fire damage, you should always contact your local SERVPRO. We'll make it "Like it never even happened." The water damage on this house was extensive. Unfortunately the homeowners do not know how long the water had been running, as they have not been on the property in a while. Due to the saturation levels of most of the walls, they had to be torn out instead of dried. The structural integrity and the chance of secondary growth posed too big of a threat within the time period we had to work with to get the walls dried. Our knowledgeable crew, experienced Crew Leads, and IICRC certified Production Managers are always prepared to handle any disaster. When water strikes, so do we. 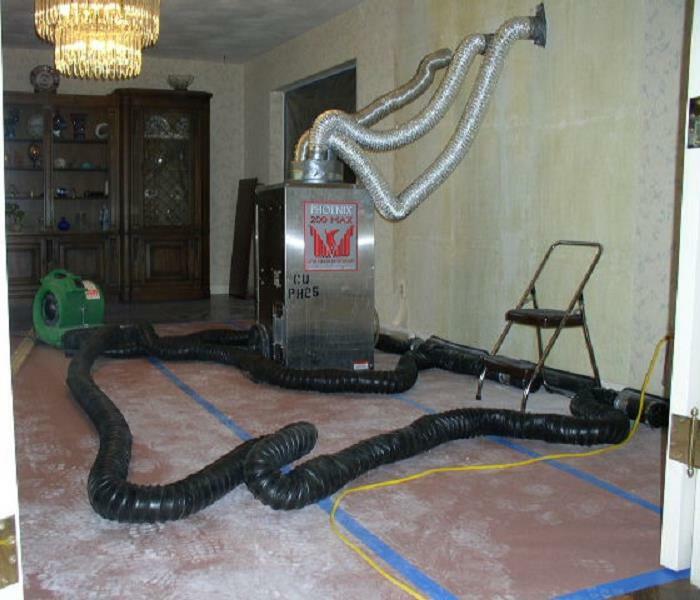 That's why you should always call SERVPRO in the event of any loss. 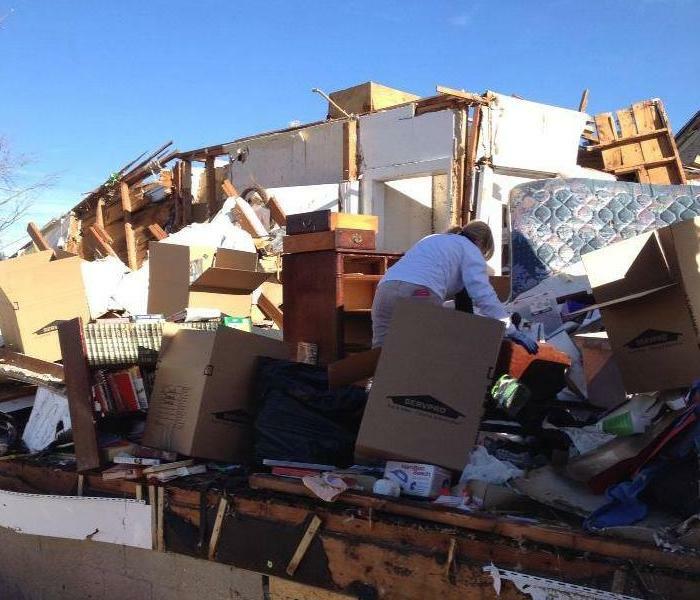 This is the devastation after the Gifford tornado which struck in November 2013. 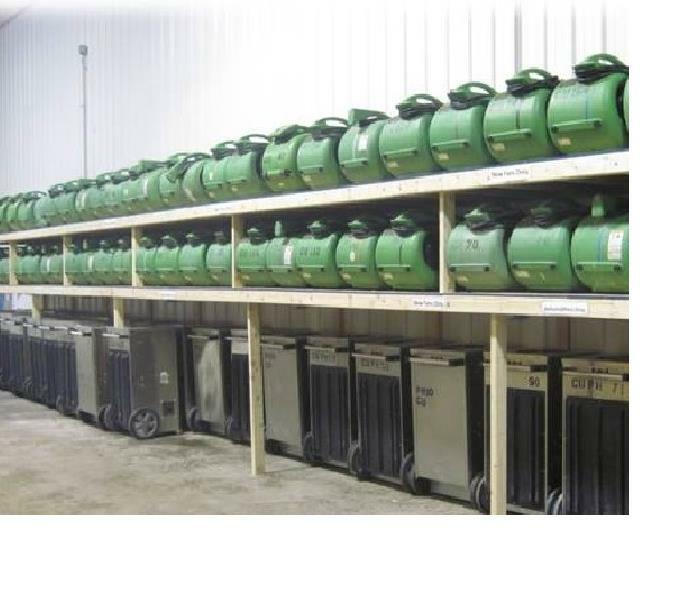 Within the days to follow, SERVPRO crews packed up, stored and cleaned contents from 10 different households. 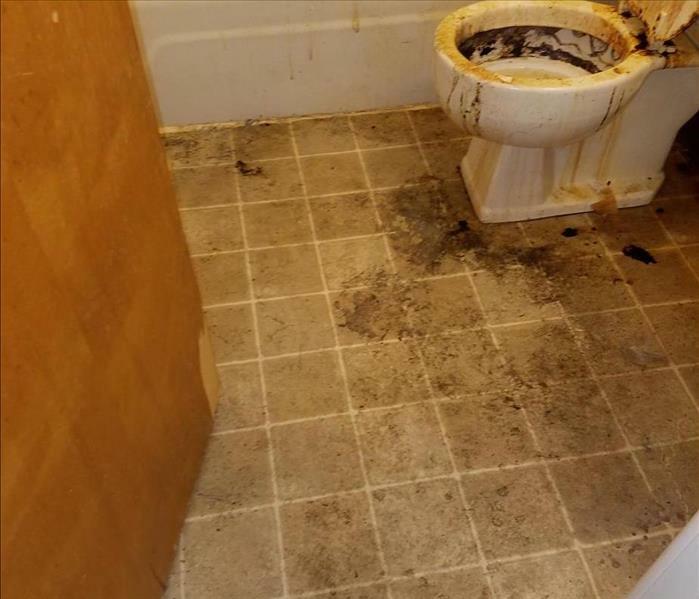 The owner of this house said over and over, "I couldn't have gotten through this without SERVPRO by my side." A Perfect Combination - Experience and Equipment! The goal of the air scrubbers is to clean or “scrub” and re-circulate the air. This allows us to remove the airborne contaminants that are found within the work area. In combination with the carpet drying fans that function as an accelerated way to dry almost any surface, this is a perfect recipe for water mitigation! SERVPRO's High Pressure Drying Systems are specifically developed to target high risk areas of hidden moisture in walls and ceilings, even those coated with watertight finishes like PVA paint and vinyl wallpaper coverings. Our crews are loading up equipment for another day of helping customers dry out from the recent downpours. Placed strategically, these fans help get the water out of structures and contents and into the dehumidifiers, restoring the area to a suitable moisture level. 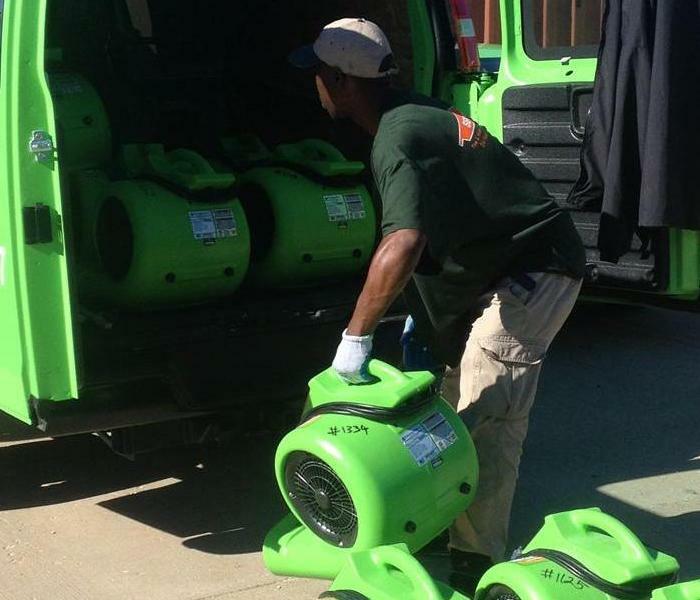 This dehumidifier that our SERVPRO teams use is an effective and versatile piece of drying equipment. It can speed up the drying process and is a particular advantage where deep drying is required, as is pictured here within the wall cavity.